Thanks for your note. I’ll pray for your comfort as you recover. I also pray for the LORD’s healing hand on your body, for strength & energy for Connie and your family. So happy you are on the other side of surgery and starting the road to recovery. We’ll be hunting inflatable lawn ornaments and watching a western hockey game before you know it! Thank for you keeping us updated. Love, light and lots of prayers!!! To see you smiling in the photo is amazing, Phil. I’m thankful that your care is all in His hands and those of the very skilled doctors and nurses at U-M. Please hug Connie for us and know that we pray for you continually. 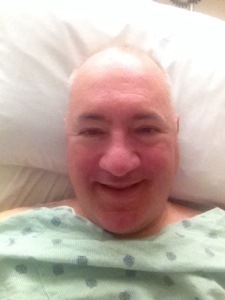 Looking good Phil glad to hear it went well!! Go Phil! You are one tough guy. It will be a little sketchy until your healing completes but you will handle it well because you’re you. Love to you and thank God you are on the road to recovery. See you soon. Love to Connie and the kids too. Hey, Phil. Sharon Tubay here. I did not know of your illness, but I pray you will be healed. Your entry about the hitchhiker really touched me. I believe he WAS an angel sent to comfort and guide you during this time in your life. May God Bless you. Phil- your perseverance and strength is simply amazing. We are each dealt a different hand in life, and you my friend, have played your hand inspirationally. You meet each challenge head on, and rather than being angry with the world, you continuously thank those whom are walking beside you through it. You recognize you are blessed- I hope you also realize you are a blessing to many. You spoke with a messenger from God the other day- an Angel- see- even God knows how special you are! Keep fighting Phil- you are winning the battle. I had so much fun this weekend. Loved picking out the 10foot tree and putting it up and the lights on it. I love doing projects with you. Hope to see you again before the family Christmas party. Phil, I just figured out how to respond to your post (I think) or I would have written sooner! Maybe I’ll conquer facebook next. 🙂 I’m so glad the surgery went well. I’m anxious to get an update to share with the prayer chain. My mom and her Bible study group have also been inquiring. Hope you’re continuing to mend. My daughter enjoyed meeting you. We are continually in our thoughts and prayers! Miss you!